Never to learn something new that life has taught us and apply it into our lives. The result of our life experiences is growth and to become the best version of ourselves. Therefore, of course we don’t want the same things in our 40s and 50s as we did in our 20s and 30s. Where we used to crave certainty and stability, a provider and protector, or a good father…Now we crave passion and connection (mostly because we’ve lived decades feeling the absence of those things and technology only keeps us increasingly disconnected from each other), intimacy and vulnerability. We want to feel alive, we want to feel both desire and desired, we want experiences more than things. NONE OF IT REMAINS STATIC. When we (or our partners) don’t want things to change, we’re reaching for control and certainty so that we can feel safe in what can feel like a pretty unsafe world sometimes. But if we don’t start embracing some degree of change and realize the perfection within that change, maybe the answer is to just up and move to some other planet. Because this planet and the people within it change……constantly. If you don’t think moving to another planet is a viable option, maybe it’s time to just EMBRACE change. Maybe it’s time to show it a little love and a little curiosity. Maybe it’s time to be open to what life has to show you and where change takes you. It’s part of our evolution. Everything is happening exactly as it should. 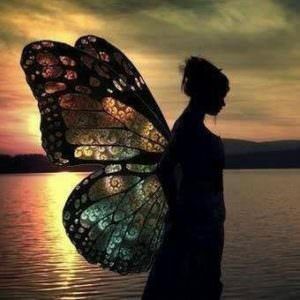 Once you realize you’ve grown wings, you have no other choice but to use them (and wings don’t fit into a small, little box). There’s not need to hide it or apologize for it. You will continue to change and evolve and grow and expand; there is no finish line. How have you changed? How have you grown or evolved? What can you feel shifting in you right now? I want to hear from you in the comments below……..